This one comes from Good Things Catered and we had it alongside the Creamy Chicken Enchiladas. It was a nice contrast to all the heat we had going on in those. Very healthy and light. Fresh herbs are key. 1. In small bowl, combine avocado, mango and juice of 1/2 lime. Toss and set aside. 2. In separate small bowl, combine remaining lime juice, garlic, salt, pepper, chili powder, and paprika. Whisk to combine and while whisking constantly, slowly drizzle in olive oil to emulsify. 3. In large serving bowl, combine salad greens, herbs and onions. 4. Drizzle on desired amount of dressing and toss to combine. 5. Top with drained mango and avocado and serve immediately. 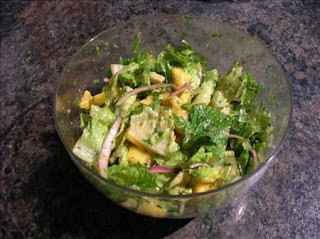 This entry was posted in entrees, salads, salads, sides and tagged avocado, cilantro, dill, lime, mango, mint, onions. Bookmark the permalink. So glad you liked it! Looks like it came out great!